This book is a work in progress. A new chapter appears at our here each week, usually on Fridays. To see all the chapters published so far, visit the *FREE READ* page for The Complete Writer. You can buy a copy, right now, in PDF format, or, if you like, as a paperback. For details, visit our Books page or send a request through our Contact form. My boss, grumbling unhappily, handed me an article we’d assigned to a freelance writer. Reading through it, I thought it seemed competent enough: the language was clear and literate, the facts were decently organized, and the writer had covered the subject comprehensively. What makes an editor sit up and shout “wow”? One sure bet is a nonfiction piece that shares some attributes with good fiction. Accomplished storytellers never bore the listener by unloading the bare facts, by divulging the punch line before the joke is over, or by revealing the key to the plot before the story’s climax. Instead, they unveil the story a piece at a time, by drawing a series of word pictures full of engaging details. The storyteller introduces people, makes them seem real, and involves them in emotions and predicaments that move the listeners. A strong nonfiction writer uses fictional techniques for the same purpose: to hold the reader’s interest. The elements of fiction are plot, point of view, characterization, theme, and setting (for more on these, see this book’s section on writing fiction). Each corresponds to a nonfictional technique. Plot is roughly the same as structure, which we examined in the last chapter. You’ll recall the feature article’s classic architecture: a lead, often containing a capsule statement or nut paragraph; development of the facts; and a wrap-up. Most fictional plots have a similar shape. Think of a movie or television show: if the story hasn’t caught your interest within the first five or ten minutes, you’ll probably leave the theater or turn off your device. A piece of short fiction must win over the reader in the first third of the story. After this equivalent of the lead, the fiction builds toward a climax or resolution of its problem and then falls off in a dénouement. Plot involves conflict. Not all nonfiction stories lend themselves to this—the only conflict in a new-product roundup, for example, may take place between the editorial and the advertising departments. But many articles do contain this element. Conflict may occur between human beings, between a person and an obstacle or handicap, between an individual and Nature or an animal, between large groups, or within a single person’s mind. Anyone who faces a problem is engaged in a conflict. You often can set up a kind of opposition within a nonfiction piece that will move the action forward to a resolution, just as a fictional story builds toward a climax that resolves the plot’s conflict. For example, you might write about a coalition of your city’s small neighborhood associations. Such groups usually form to fight city hall. Leaders may say they exist for local beautification or to sponsor block parties. But sooner or later, they involve themselves in zoning questions, highway development, taxation, crime-stopping programs, or whatever. Knowing this, you would focus on some problem the local groups took on, and you would use that conflict to show members in action. The story’s body would move toward the disposition of the issue, and in doing so, would cover the coalition’s history, function, and methods. For a “dénouement,” the story might wind up with a quote or two on the group’s effectiveness or a mention of plans for the future. An approach like this allows you to hold forth on the issues while you show how they affect real people. Even when no conflict is inherent in your story, you should present your facts so that they build to a logical, satisfying conclusion. In other words, you should avoid either dumping all your information in a single pile or stringing the facts out at random so they go nowhere. The story should open on a captivating note, move toward some meaningful high point, and leave its readers feeling they have caught its significance. 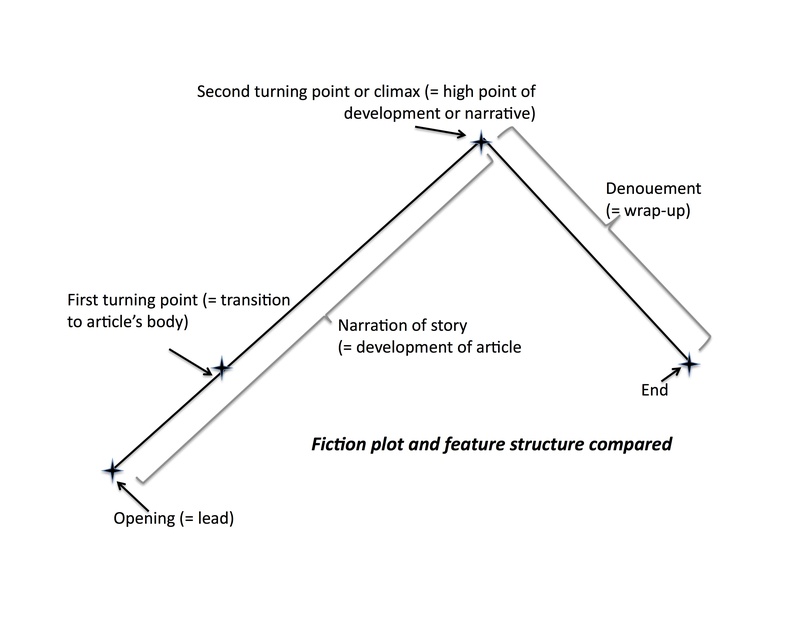 Point of view, in nonfiction as in fiction, has to do with the perspective from which the story is told. The most obvious approach to nonfiction is to report the facts from the journalist’s equivalent of the omniscient point of view. But that’s not always the most desirable choice. Sometimes it’s better to tell the story through the eyes of one of the people involved, even if that person is yourself. The trick to relating a story from a specific point of view is to maintain the same perspective throughout. Once you’ve begun to narrate the story from one person’s viewpoint, do not waver by inserting someone else’s observations or your own comments. Note the difference between point of view and the grammatical term person. By first person, we mean the subject of a verb is “I” or “we.” In the second person, the verb’s subject is “you,” and in the third person, “he, “she,” or “they.” Narrative is most often written in the first or third person. Marguerite Reiss, in a Reader’s Digest story, reported a bear attack from the victim’s point of view, but writes Rollin Braden’s story in the third person: “Rollin didn’t relish crossing tracks with [an Alaskan brown bear]. . . . The only sound he heard. . . . He knew. . . .” Although she never uses the first-person “I,” the story is told from a single perspective: Rollin’s. Everything that takes place is experienced through him: we hear, see, and feel what he hears, sees, and feels as the events happen to him. We never see any of the story from the bear’s viewpoint, nor through the eyes of his companions on the hunting trip. Had Reiss allowed the focus to slip, the story would have lost its impact. Good characterization presents a believable word picture of a human being. As soon as you introduce an individual into a story, you should describe and characterize him or her. Whether the person is real or imaginary, any ink-on-paper portrait is an abstraction. You can never present another human being as he or she actually is; the best you can do is show how you perceive someone. For this reason, John McPhee’s Thomas Hoving is as much a literary character as John Updike’s Roger Lambert. The fiction writer must provide enough detail to convince readers that the characters act as they do for believable reasons. As a nonfiction writer, you have an added problem: you cannot manipulate or re-imagine a real person’s motives or words to make them fit the story. We perceive a person on several levels. One is superficial: we see her clothes, her physique, the color of her hair and eyes; we observe her mannerisms and hear the cadence of her speech; we sense the mood of the moment. As we come to know her better, we discover a second level of her reality: what she does for a living; where she grew up; how she was educated; what her parents, spouse, and children are like. The deepest level is psychological. She feels; she thinks; she responds to her environment in special ways. Key factors in her life have changed her: divorced parents, perhaps, or an accident, an abortion, a lost lover. These elements need not be dark—they might include a chance to study art coming at a moment of indecision, a special teacher, or a meeting with an admired role model. Writers draw people just so. A one-dimensional or flat character is lightly sketched—usually with one or two physical characteristics or an allusion to some habit. In describing a courtroom scene, for example, you would fill the spectator’s gallery with one-dimensional characters. The danger in picking out a single trait, of course, is the lurking cliché. Try not to populate your story with good-old-boy businessmen, liberated grandmothers, macho truck drivers, and similar stage figures. Two-dimensional characters are more carefully drawn, with allusions to their personal background, tastes, and aspirations. You often find them in the standard 1,000- to 1,500-word magazine profile. We meet a young tycoon who at the age of 17 decided he could buy fast cars sooner by selling houses than by attending college, and voilà! Now he heads a multistate real estate empire. The story may interest the reader in passing, but it offers little real insight into the subject’s personality. Three-dimensional characters result from fleshed-out, fully rounded portraits. They happen when a writer knows a subject intimately, the result of long conversations and much time spent together. This picture tells us what the person looks like, where he grew up and went to school, who are the most important people in her life, and whether in an Italian restaurant she’ll choose spaghetti over veal saltimbocca—and then it tells us why. New Yorker profiles provide outstanding examples of fully drawn nonfictional characterization. Another literary technique commonly used in nonfiction is dialogue, or, in the language of journalism, quotes. Direct quotation gives life and spirit to a narrative—but only when handled with some grace. Quotes serve several purposes. In exposition—where you are explaining a subject—quotes allow voices other than the writer’s to comment. This adds interest or authority to what is being said. You might use an expert’s remarks to support a generalization, or have a witness to some event speak about what she saw, heard, or thought. Fitts, however, [said] he had reservations of his own regarding a constitutional challenge to his indictment because he wanted the opportunity to prove in court that what he wrote about the two politicians is true. That quote emphasizes the point without repeating it, and it adds a fact. Another quote in the same story demonstrates a different use of quotation: to characterize. Robovsky shouts , stamps, and gives a convincing display of what we think of as Hungarian temperament. He scolds the boys for landing too audibly. “Do I hear noise? Oh, the noise is killing me! You are landing with thuds.” Then he laughs and everyone relaxes. In writing dialogue, novice writers often stumble over attributions, those words that tell who said what. In “‘I find Paul appealing and Peal appalling,’ said Adlai Stevenson,” the word said is an attribution. Ordinarily you should start a new paragraph for each new quote, unless the quote supports a point you are making within a paragraph. When two or more people converse, begin a new paragraph with each change of speaker. Attribute as often as is necessary for clarity: you need not attribute every utterance, as long as the speaker is clear to the reader. Newspapers often invert the normal word order in attributions: “said Adlai Stevenson,” rather than “Adlai Stevenson said.” Some editors dislike this style. Do not feel you must use one or the other. Listen to the rhythm of the prose and use the order that best pleases the ear. Setting reveals the story’s time, place, and social milieu. Drawing a setting requires skill, both as observer and as writer. Description may be vivid, but it must never be purple—that is, florid, overblown, or gaudy. John Malard sat at a small kitchen table covered with a blue plastic cloth, and with strong, thick fingers stroked the stubble on his chin. His black hair was cropped to its roots, his glasses coated at the edges with the grit of a morning of tilling in his stunted cornfield, which hugs a bluff above the Missouri River between Bismarck and Cannon Ball, N. Dak. The 93ºF wind scoured the boards of his tiny home, gusting and swirling up to 30 m.p.h., drying, loosening, lofting, trying again to blow him away. The big prairie sun, without a wisp of cloud to soften it, hammered the land as far as a squinted eye could see, which is a long way out there. Rather than flatly saying Malard is a farmer, Sidey shows us a man who tills a cornfield. In this lead to a story about a drought, Sidey does not use the word “drought.” Instead, he draws a picture: grit, stunted corn, 93º winds, the sun, the squinted eye. Note how specific the details are and how they add up. We see Malard, who is immediately named. His small kitchen table covered with a blue plastic cloth signals a man of modest means with middle-class, pragmatic tastes. His black hair is cropped to its roots, suggesting middle- or working-class conservatism—he wears his hair like a U.S. Marine’s The words “roots” and “cropped” are connotative. He has strong, thick fingers: a working-man’s hands. The stubble on his chin says he didn’t stop to primp on the way to a hard morning in the fields. That he has been tilling tells us he farms. He raises not just any crop, but corn, the quintessential American grain, and the cornfield is stunted, a sign something is wrong. In the second paragraph, Sidey uses a literary device known as “pathetic fallacy,” in which Nature is imagined to reflect, sympathize with, or be capable of human actions. The thirty-mile-an-hour winds try to blow Malard away. Of course, the wind has no motive, nor can the sun consciously hammer the land like the Norse God Thor. Other verbs also carry faint suggestions of human behavior: scoured, lofting. The entire setting is allusive. A man speaking from his small kitchen table in a tiny house hugging a bluff in the harsh vastness of North Dakota evokes a favorite American folk image: the little guy who stands up against massive, primal forces. The strength of this passage lies in its restraint. Add any elaboration at all—one more windy verb, an extra adjective about the sun, a whiff of pity for Malard—and the writing would turn mauve. But because the details are carefully chosen, very specific, and concise, they paint an effective, convincing picture. A story’s theme is its sense of meaning: why do the things you’re writing about matter? An article, like a novel, short story, or play, expresses its author’s perception of life. In rare cases, you may communicate your view of the facts explicitly, through direct comment. Usually, you work it into the story through allusion and symbol, and by showing believable characters in meaningful action. Barry Bearak, in his profile of comedian Sonny Sands, uses a sophisticated literary device to let us know why his subject matters. He manages, through the use of language, allusion, and subtle comparison, to make Sonny a kind of symbol. More than an aging comic, Sonny represents the decrepitude that all of us face, and at the same time he stands for an entertainment era that has passed. Bearak suggests this in his choice of quotes (“Life is like a composition. . . .”; “How much time you think you got in this world?”); by placing Sonny in a historic context; by suggesting that most of Sonny’s audience now live in condominiums for the elderly; and by contrasting the old pro with a young part-timer whose life is radically different from Sonny’s early life. In the stratospheric realms of literary criticism, this technique is called iconography. To find it in journalism is so rare as to be startling—Bearak won a Pulitzer with it. Several expedients can help bring the reader to the edge of the chair. Most obvious is withholding information until the end of the story. We know, for example, that Rollin Braden will survive the bear attack—otherwise, the story wouldn’t appear in Reader’s Digest. But we don’t know how he will escape or what will happen to him before he does. In “Nightmare Hunt,” Reiss builds suspense by dropping hints in the first few paragraphs. “Thought you told me I’d see some bears,” Darrel chided his friend. . . . Alaskan brown bears forage intensely before holing up for the winter. Rollin didn’t relish crossing tracks with this one. . . . Suddenly Rollin sensed something. . . . there was a rustle. . . . Before long he was 300 yards into the woods, then 400 yards. A chill rippled through his body. He knew that whatever animal he had heard was probably watching him right now. . . . A branch snapped. . . .
All these details foreshadow something ominous. Later in the piece, the suspense resumes when the enraged animals back off momentarily during their attack. Rollin could hear the bears nearby . . . the seconds ticked by . . . the heavy panting subsided. . . . Telling the story from Rollin’s point of view also helps create a sense of tension, because it builds empathy. “I learned to put myself in the person’s shoes, in interviewing as well as writing,” Reiss says. “Rather than being objective and standing away, like I used to do in newspaper work, you have to actually get in and almost hurt with the guy. Details like this make the story. A fiction writer may invent details. In nonfiction, you must be absolutely factual. But there’s a reason articles are called stories: that’s what any good writer tells. This entry was posted in Uncategorized on May 18, 2018 by funny.